A Tragic Accident happened today. Betty just had to try on our new Ruby Red Slippers. Of course the first thing we thought of was to set up a display and snap pictures. Betty Ensor Thomas ..... Side Gore is the Slip-on version of 'Bout Time. As you can see this great style can be used for either Casual Wear or as a Dress Shoe. The genuine moccasin construction of this style wraps the finest soft supple leather completely around the foot. Side Gore comes with all of the SAS® Bells and Whistles. Those include the SAS Selfset® Foot Bed, the SAS Tripad-Moc™ Construction, the Soft Step™ Heel, and the Lightweight Flexible SAS Supersoft® Sole. Add in the padded tongue and collar, the firm heel counter, and the EZ™ Gore and the package is complete. Betty Ensor Thomas ..... I have mentioned our Top Selling Men's Style by SAS® in several blogs, but now I feel that it is time Time Out has a Blog dedicated to it and it alone. I refer to Time Out as our "Awwww Shoe." That means that no matter how your feet feel prior to trying a pair on they will say Awwwww. 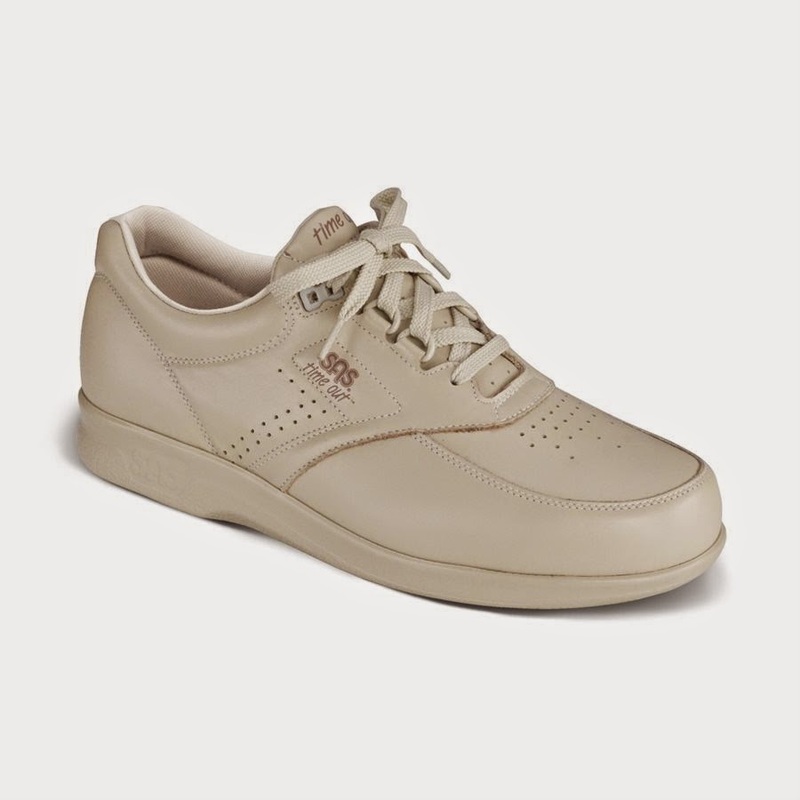 With it's Added Depth and Wide Toe Box - Freetime is recommended by Podiatrists, Orthopedic Doctors, and is Medicare Approved for Diabetic Feet. 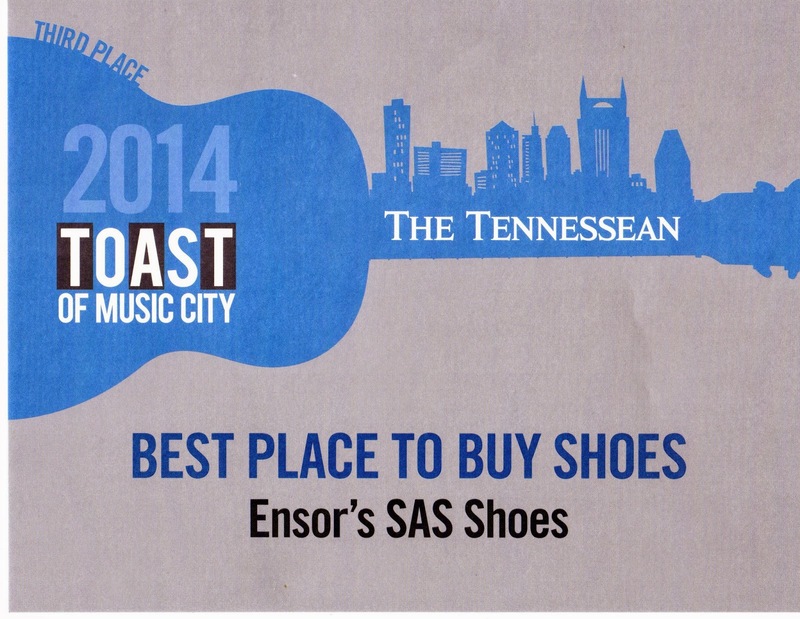 Time Out is designed to fit and follow the shape of your foot and is made on an exclusive SAS® Walking Shoe Last. The initial fit of Time Out should be wide enough to stay comfortable across the ball of the foot yet roomy enough in the front so the toes are not cramped. This leather shoe has Extra Toe Room, a padded tongue with an elastic gore stitched to the lining to hold the tongue in place. 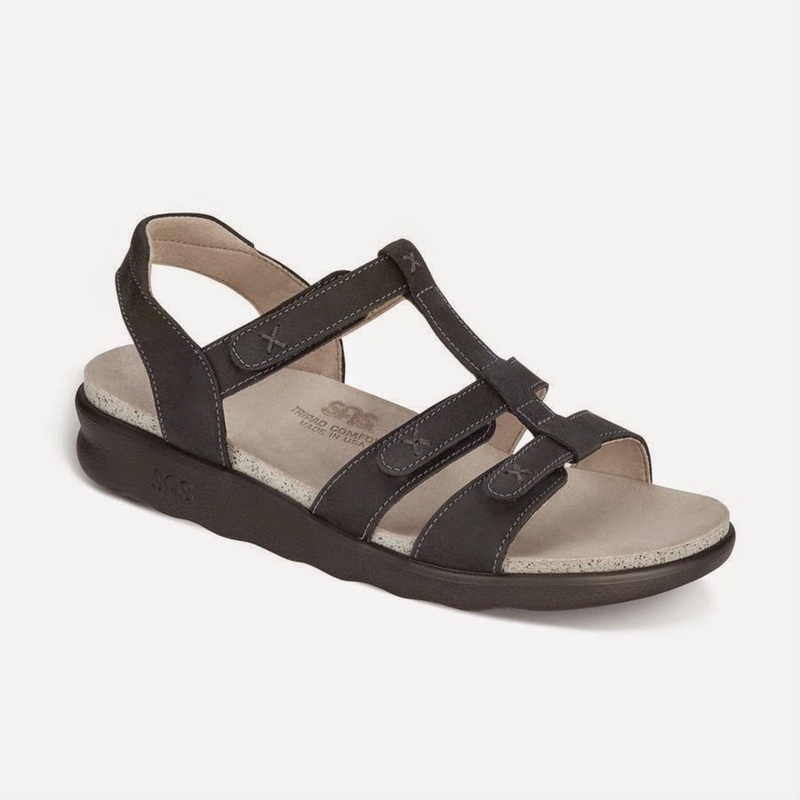 It comes with a No-Bite™ Padded Collar, a firm heel counter and lots of ventilation to help keep your feet cool and dry. It also comes with the SAS EZ Lace™ System. The SAS Selfset® Foot Bed liteSAS Green Odor-Resistant Tripad® Cushions are located under the main pressure points of the foot. This material never loses its shock-absorbing ability. 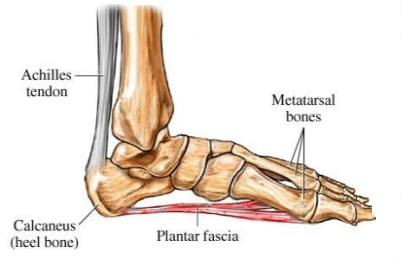 The SAS Selfset® Foot Bed literally molds to the shape of the foot. On the underside an Arch Cushion helps maintain the contour and height of the arch. This Foot Bed is removable, washable, replaceable, and without provides easy accommodation for orthotics. base for stability and maximum shock absorption. The sole is made out of long-lasting, molded polyurethane containing millions of tiny air bubbles to cushion every single step. 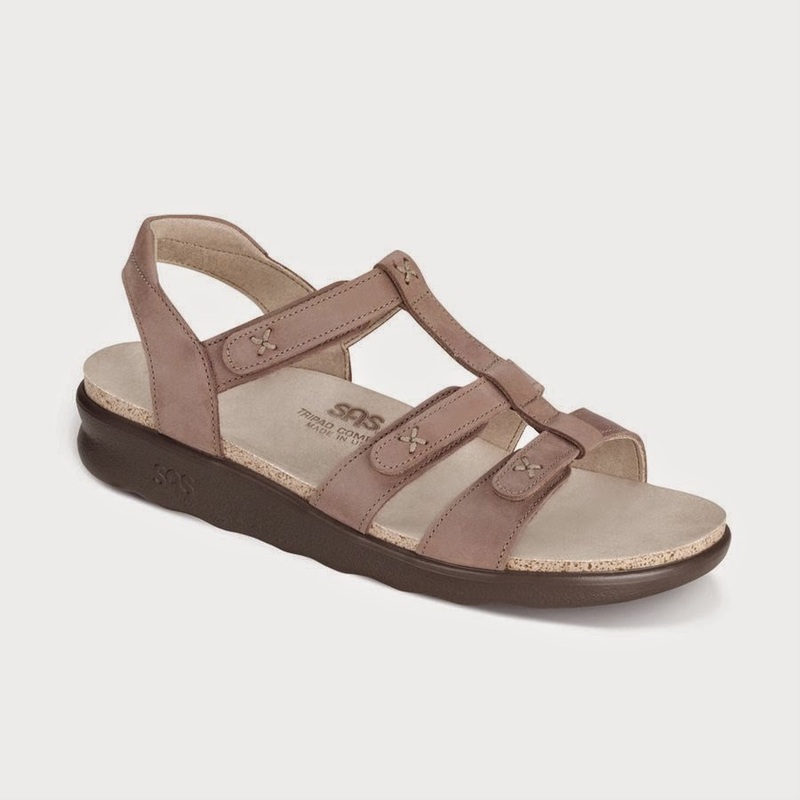 This includes the SAS Soft Step™ Heel that helps reduce heel shock. Everyone deserves to try a pair of these shoes on. Wide 6-15, Wide-Wide 6-15, and 3Wide 6-13. Betty Ensor Thomas ..... I have mentioned our Top Selling Women's Style by SAS® in several blogs, but now I feel that it is time Freetime has a Blog dedicated to it and it alone. I refer to Freetime as our "Awwww Shoe." That means that no matter how your feet feel prior to trying a pair on they will say Awwwww with delight. Freetime is designed to fit and follow the shape of your foot and is made on an exclusive SAS® Walking Shoe Last. The initial fit of Freetime should be wide enough to stay comfortable across the ball of the foot yet roomy enough in the front so the toes are not cramped. 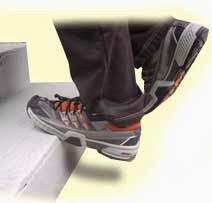 SAS Green Odor-Resistant Tripad® Cushions are located under the main pressure points of the foot. This material never loses its shock-absorbing ability. Well, if you made it though all of that then you can see why I call Freetime the "Awwww Shoe." Everyone deserves to at least try a pair of these on. Chances are that if you drop in and see us in the Fall/Winter time you will see me wearing a pair of these in the next (and last) color shown below. Wide 5-12, Wide-Wide 5-12, 3W 5-12. Wide 5-12, and Wide-Wide 5-12. 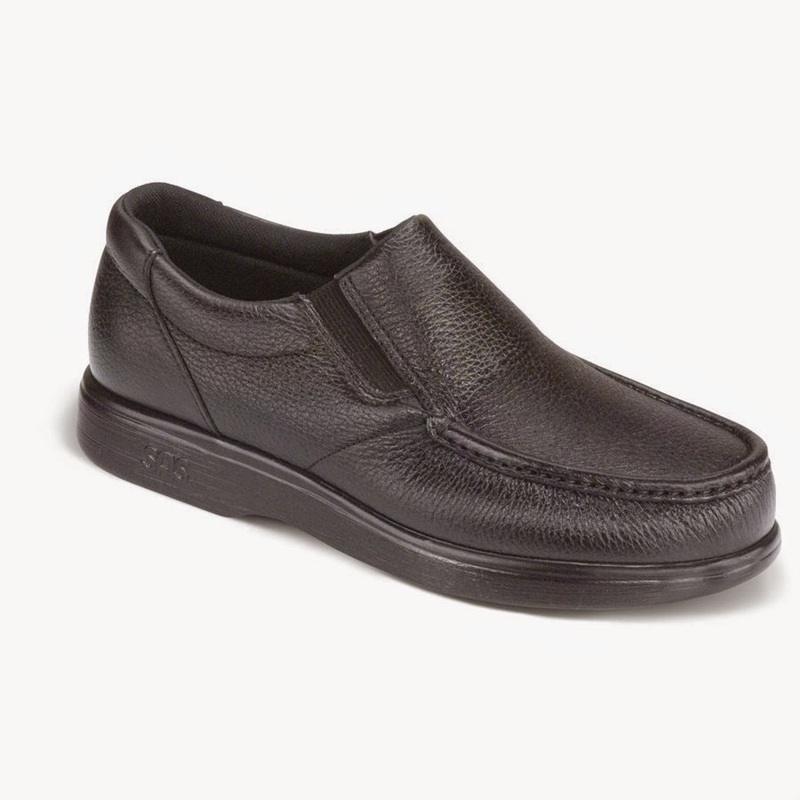 Betty Ensor Thomas ..... Twin is another slip-on shoe from SAS® that packs a lot of punch. 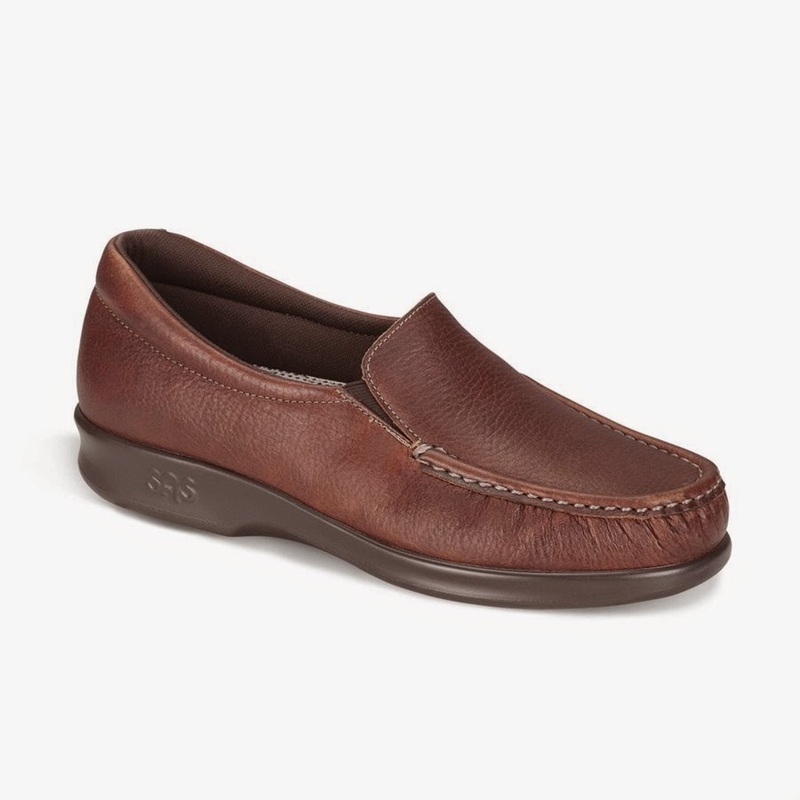 One of the best things about Twin is the hand laced moccasin construction that wraps the soft leather completely around the foot. 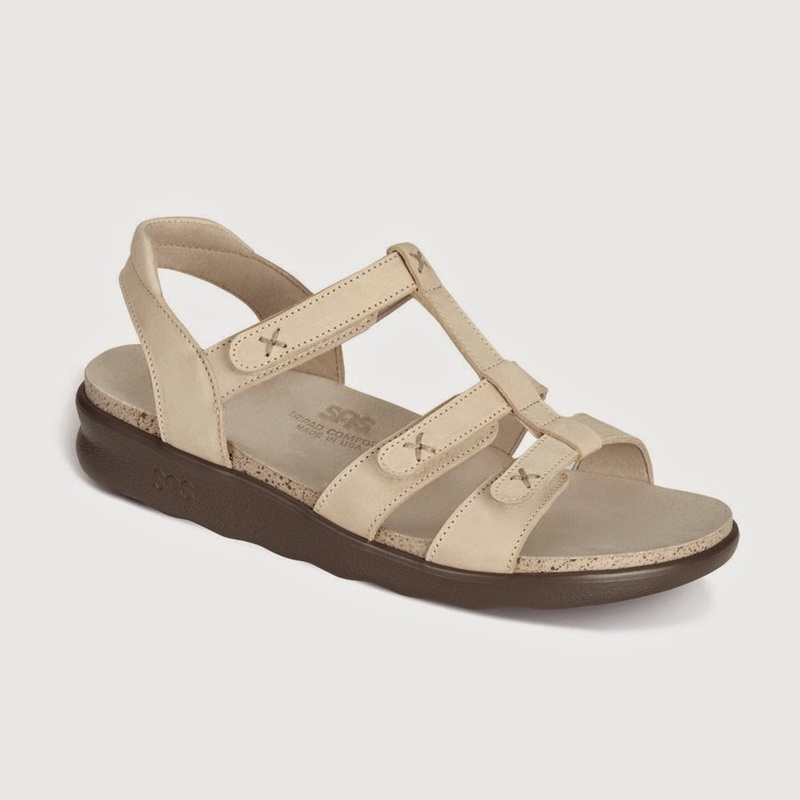 That hand laced construction leaves soft gathers around the toe area which is perfect for those that have sensitive toes. 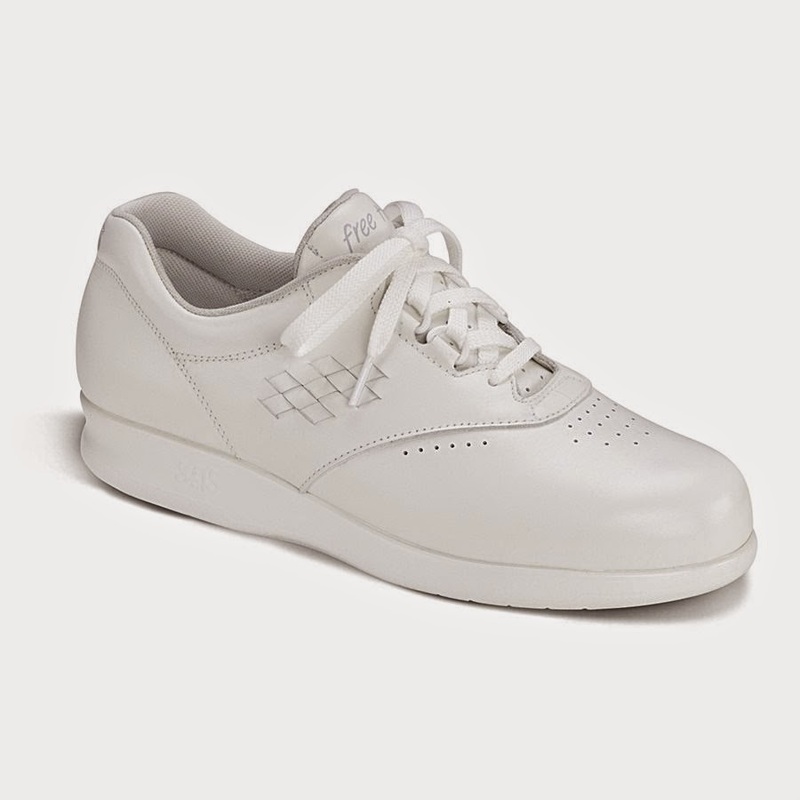 The soft leather upper is padded in the tongue area for instep comfort. They included a firm heel counter for stability and a No-Bite™ Padded Collar for ankle and heel comfort. TWIN has the SAS Selfset® Foot Bed that molds to the shape of the foot, a insole for added stability, and the SAS Tripad™ cushions under the main pressure points of the foot. The Lightweight Flexible SAS Supersoft® Sole provided maximum shock absorption and cushions every single step. Add the Soft Step™ Heel with a wide heel base and you have extra stability and greatly reduced shock. TWIN is available in Black and Mulch. TWIN is available in the following sizes and widths. Keeping your feet happy and healthy since 1993. Betty Ensor Thomas ..... Another addition in our efforts to "keep your feet healthy and happy" is another Spenco® insole. We choose the Polysorb® HeavyDuty Insoles. These insoles are designed for All Day Long Maximum Comfort and are great for those that stand or walk on hard surfaces. SpenCore® Heel-strike Pad provides extra cushioning and shock absorption in the heel. Spenco® Polysorb® HeavyDuty Insoles are ideal for work shoes and boots.